There's maybe one thing the citizens of Earth love more than the festive activities and gentle winds that betide sweater weather, and that's stuff getting smashed by other stuff. A group of brilliant Canadian fundraisers exploited the wholesome impulse that forces us to drink pumpkin spice lattes every fall and the less wholesome but equally understandable impulse to watch things ritually destroyed when they used an absurdly huge pumpkin to smash a car for charity on Sunday. 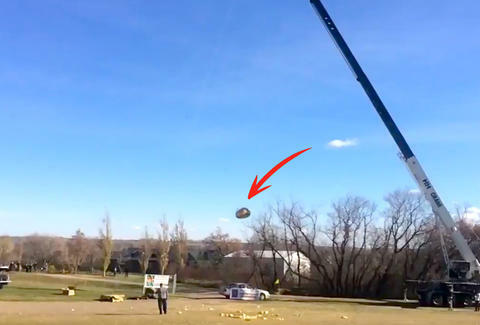 Almost 2,000 onlookers watched three pumpkins fall from 120 feet in the middle of a field in Saskatoon, which is a city in Canada and a fun word to say. Operation Pumpkin Drop (also fun to say!) was put on by the Honourable Order of the Blue Goose International (they really know how to name things up north), an insurance industry fraternity. All in all, the event raised $9,000 for the Saskatoon Fire Fighters Pediatric Fund, which puts on programs for children diagnosed with cancer. Who among us could deny that charity, harmless destruction, and squash make for the ideal Sunday? The day's first pumpkin weighed around 1,300 pounds and was dropped onto a beige Nissan Maxima. As you can see in the video below, they pretty much turned it into a Nissan Minima (right??). The second freakishly large, soon-to-be-squished squash was filled with a huge amount candy. Just after its implosion, as you can see below, a horde of kids descended upon it like something out of a Cormac McCarthy novel. It’s a really nice moment. The final pumpkin (no video for this one, sorry) was filled with pingpong balls that shot outward toward a target. A ball could be purchased for $5, and the owner of the ball that landed closest to the target won a prize. Call your mayor immediately because this type of festive joy should be mandatory in every town every October. James Chrisman is a News Writer at Thrillist who thanks the noble pumpkins for their sacrifice. Send news tips to news@thrillist.com and follow him on Twitter @james_chrisman2.